Over the years, our law firm has had the opportunity to assist families with the estate planning process. We have provided assistance at various points in the process but have provided all clients with initially the same basic information. Prior to beginning any estate plan, it is essential that you and your family understand some basic terms. This is preecisley why I published a great book on Estate Planning--STRONG, with my wife. During the estate planning process you will encounter a number of terms that you often don’t see or hear in your everyday life. It’s important to understand these terms because everyone involved in the probate process, including your attorney, will use them. If you don’t understand them you should ask your lawyer because you may miss an important part of the process which could result in confusion and defeats the whole purpose of estate planning. Administrator (ix) – the person appointed by the court to manage the assets and liabilities a person who dies without a Will. Executor (ix) – the person named by the deceased to carry out the provisions in a Last Will and Testament. Fiduciary – a person who must exercise a high standard of care in managing another person’s money or property. A fiduciary can be an administrator, an executor, or a trustee. Decedent – the person who has died and whose estate is being settled. Trustee – the person who has the legal authority to hold property for the benefit of another and who owes a fiduciary duty to that person – the beneficiary. Settlor – a person who creates a trust. Beneficiary – one who receives property or some other asset from a trust, a Will, an insurance policy or some other contract, agreement or legal entity. Heir – a person, who under the law of intestacy, is entitled to receive an intestate decedent’s property or a person who is entitled to receive it under a Will. Legatee – a person who is named to receive personal property through a Will (cash or something other than real estate). Lineal Descendent – a person who derives from a common ancestry especially a direct line of heredity; a direct blood relative. Probate – process of administering a deceased’s estate. This includes distributing his/her assets, paying liabilities (inheritance and estate taxes along with any long term or short term debts). 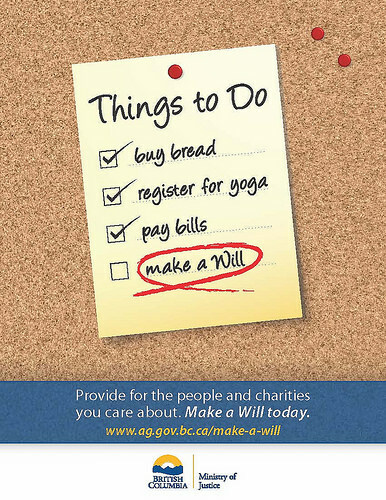 Testate – when a person dies and leaves a Will. Testator (ix) – the person making a Will. Intestate – when a person dies and does not leave a Will. Letters of Testamentary – a document issued when a person dies with a Will and the named executor accepts the duty to administer the Estate. Letters of Administration – a document issued to the person appointed to administer the estate when a person dies without a Will.